MANGO (Mangifera indica), the king of fruits, is grown in India for over 4000 years. More than 1,000 varieties exist today. It is grown in almost all the states. India shares about 56% of total mango production in the world. Its production has been increasing since independence in 1947, contributing 39.5% of the total fruit production of India. Andhra Pradesh tops in total production, whereas Uttar Pradesh tops area wise. Andhra Pradesh, Uttar Pradesh, Bihar, Karnataka, Maharashtra, West Bengal and Gujarat together contribute for about 82% of the total production in India. Mango is a tropical fruit, but it can be grown up to 1,100m above mean sea level. There should not be high humidity, rain or frost during flowering. The temperature between 24 and 27`C is ideal for its cultivation. Higher temperature during fruit development and maturity gives better quality fruits. The areas experiencing frequent showers and high humidity are prone to many pests and diseases. Thus it can be grown best in regions with a rainfall between 25 cm and 250cm. Regions having bright sunny days and moderate humidity during flowering are ideal for mango growing. India is the home of about 1,000 varieties. Most of them are the result of open pollination arisen as chance seedlings. However, only a few varieties are commercially cultivated throughout India (Table 1). One of the most popular of India, it is mainly grown in Ratnagiri area of Maharashtra and to a small extent parts of south Gujarat and Karnataka. Its fruits are medium sized (250g), with attractive blush towards the basal end. Pulp is firm, fibreless with excellent orange color. It has good sugar: acid blend. Keeping quality is good. It is susceptible to spongy tissue. It is a widely cultivated, early maturing mango of south India. It is the main commercial variety of Andhra Pradesh. Its fruits are large sized, weighing on an average 350-400 g. The pulp is fibreless, firm and yellow with sweet taste. Fruits have good keeping quality. 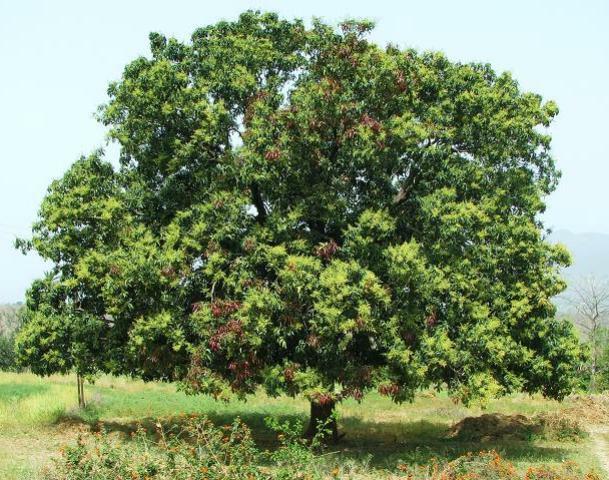 It is one of the earliest varieties of north India. Its fruits are medium- sized, weighing about 250g each. Fruits have strong and pleasant flavour. Pulp is soft and sweet. Late- maturing variety of south India, it matures during July or beginning of August. Fruits are large, weighing about 350g each. Fruits are bright yellow with soft and sweet pulp. It is shy bearing. 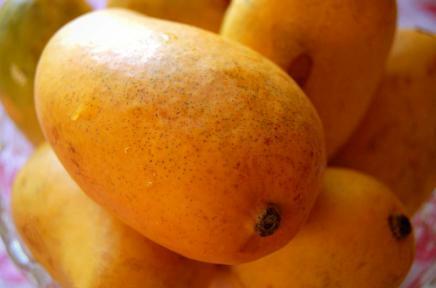 One of the most popular variety of north India, it is a mid-season mango. Fruits are medium sized, with pleasant flavour, sweet, firm and fibreless pulp. Stone is thin and keeping quality good. This is indigenous to Bihar and West Bengal. Fazli is a late maturing (August) mango. Fruits are large, with firm to soft flesh. Flavour is pleasant and pulp and pulp is sweet and fibreless. Keeping quality is good. It is indigenous to Bihar. Regular and heavy bearer, it is mid season mango. Fruits are small to medium- sized. It has rosy flavour. Fruits are amber yellow with reddish blush towards the base and on sides. Keeping quality is good. 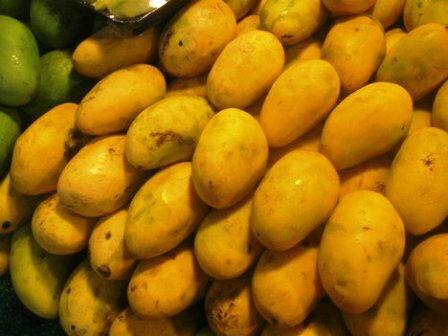 Very popular in West Bengal, it is a regular-bearing mango. Its fruits are medium-sized, having good quality. Flesh is firm, yellow, and fibreless with pleasant flavour. Keeping quality is good. Popular in Saurashtra region of Gujarat, Kesar is an irregular bearing mango. Fruits are medium sized. Flesh is sweet and fibreless. It has excellent sugar: acid blend. Fruits ripen to attractive apricot yellow color with red blush. It has good processing quality. Indigenous to West Bengal, it is mid season mango. Fruits are medium to large sized, good with a pleasant flavour. There are traces of turpentine. Flesh is firm with fibres. Keeping quality is good. An important commercial mango variety of north India, it is biennial- bearer and a mid season variety, with good quality fruits. Flesh is firm, lemon yellow in color and scarcely fibrous. It has characteristic turpentine flavour. Keeping quality is medium. It is a mid-season variety, popular in Goa. Fruits are medium sized with yellow skin. Flesh is firm, cadmium yellow and fibreless. Keeping quality is good. A heavy yielding, late season mango in south India, it has regular bearing habit. Fruits are medium sized with good flavour. Flesh is soft, yellow and fibreless. Keeping quality is good. A native to coastal Maharashtra including Goa, it is an early-maturing, heavy and regular bearer mango. Fruits are medium sized with good quality. It has good flavour with sugar: acid blend. Flesh is soft, primuline-yellow and fibreless. Keeping quality is poor. Widely grown in south India, Totapuri is a regular and heavy bearing mango. Fruits are medium to large with prominent sinus. Fruit quality is medium. It has a typical flavour and flat taste. Flesh is cadmium yellow and fibreless. A number of selection / hybrids of mango have been evolved. These include Clone C-51 from Dashehari selected at the ICAR Mango Research Station , Lucknow, and an off season selection, Niranjan, selected at Parbhani. New clonal selections from Langra and Sunderja have been made at Varanasi and Rewa. A clonal selection, Paiyur 1, has been made from Neelum, in addition to few dwarf polyembryonic selections made in the north-eastern region. As a result of systematic hybridization, several hybrids have been released. However, only a few have become commercially acceptable. Their parentage and important characteristics are given in Table 3. Of these, Mallika, Ratna and Arka Puneet are becoming quite popular. Mango is a highly heterozygous and cross pollinated crop. There are two types of mango varieties. Most of the varieties in south are polyembryonic and thus give true-to-type seedlings. In north, there are monoembryonic and need to be propagated vegetatively. Inarching: It is one of the most widely practiced methods of grafting. One can get a big sized plant material for planting with over 95% success rate. Epicotyl/ stone grafting: This method is widely practiced in the Konkan region of Maharashtra. The germinated seedlings of 8-15 days old are used for grafting. Different systems of planting like square, rectangular and hexagonal are followed at different places. However, square and rectangular systems are also popular. The spacing depends on the vigour of the variety and the cropping system. The main field is brought to fine tilth. Pits of 1mx 1m x1m size are dug. These are exposed to sun for about 30days. Before planting, pits are filled with well rotten farmyard manure. The top and sub soil are taken out reparately while digging the pits. The grafts should be planted during rainy season. In the in situ grafting, rootstocks are planted in the main field. Then they are raised for six months to one year. Then the scions of the variety that need to be grown are taken and grafted. This is usually done when humidity is high. After grafting the scions are covered with polythene covers. High density planting helps increase the yield / unit area. In north India, mango Amrapali is found amenable for high density planting with a spacing of 2.5 m x 2.5. Soil drenching with paclobutrazol (2ml/ tree) induces flowering during off year. It has become a commercial practice in Konkan region of Maharashtra. If coupled with pruning, it helps increase production/ unit area in Dashehari. The polyembryonic mango Vellaikolumban when used as rootstock imparts dwarfing in Alphonso. The nutritional requirement of mango varies with the region, soil type and age. A dose of 73g N, 18 g P2 O5 and 68 g K2 O5/ year of age from first to tenth year and thereafter a dose of 730gN, 180 g P2, O5 and 680g K2 O should be applied in two split doses during June- July and October respectively. Spraying of zinc sulphate (0.3%) during February, March and May is recommended to correct the zinc deficiency. Spraying of Borax (0.5 %) after fruit set twice at monthly intervals and 0.5% manganese sulphate after blooming corrects boron and manganese deficiencies respectively. In mango, intercropping helps check weed growth and reduces nutrient losses. Intercropping black gram—wheat—mango and brinjal – onion-o mango gives better monetary benefits. Besides, taking up cover crops like sun hemp, cowpea, pea and berseem help prevent soil erosion. Precise water requirements for mango have not been worked out so far. The water requirements mainly depend up the age, soil type and climate. However, young plants up to two year old should be watered regularly. The newly planted grafts need about 30 liters of water every week. Irrigating grown up trees after fruit set at 10 days interval increases their yield. Mangoes should be harvested wit pedicel. Injury to the fruits during harvesting brings down their quality and also makes them prone to fungal attack. Several types of harvesters have been developed. These devices are simple and efficient in harvesting. 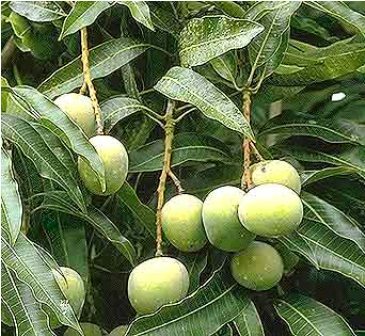 Yield in mango varies with the region. However, on an average, mango yields eight tons/ha. Yield also varies with the region. The productivity of mango is higher Andhra Pradesh and Bihar. With the adoption of high density planting, its yields can easily be increased. The north Indian mangoes Langra and Dashehari are alternate bearers, whereas most of the south Indian mangoes are regular bearers. Mango Mallika and Amrapali is also comparatively regular bearer. After harvesting, mangoes are graded according to their size. To maintain the quality, proper packaging is a must. In western region, bamboo baskets are used for packing. A basket contains 50-100 fruits. Straw is used for packing. Wooden boxes are also used in some place. However, now perforated cardboard are generally used. In these boxes either fruits are individually wrapped with tissue paper before packing or paper shavings are used for cushioning. Minimizing the postharvest losses is one of the most important aspects. Usually green and mature mangoes are stored better than ripe ones harvested from trees. Low temperature storage, controlled atmospheric storage, use of chemical treatment for delaying ripening, irradiation heat treatment, packaging and shrink wrapping are methods to increase their shelf life. This temperature of 5`– 16`C for different varieties is ideal for storing. Mangoes are highly susceptible to low temperature injury. Loss of flavour and development of undesirable softening are major symptoms of chilling injury. Under controlled atmospheric storage, retardation of respiratory activity, delaying of softening, color development and senescence of fruits take place. Hence, this method has not been adopted in mango. The combination of waxing (3%) along with hot- water treatment results in good quality fruits with extended storage life. Individual wrapping of fruit imparts uniform color and reduces shrinkage. Hydro-cooling at 12`-15`C and holding for two weeks at 15`C followed by storage for one week at ambient temperature gives good storage life to fruits. Alternate bearing has been one of the major problems. Most of the south Indian varieties are regular- bearer, whereas north Indian ones alternate-bearer. Paclobutrazol is a promising chemical for flower induction in mango. Soil drenching with Paclobutrazol (5 g and 10g/tree) results in minimum outbreak of September to October vegetative flushes. It gives early and profuse flowering and more annual yield without affecting fruit size and quality. It isone of the most important disorders, causing huge losses. It is a major problem in Punjab, Delhi and Uttar Pradesh. However, it has also been noticed in Gujarat, Maharashtra, Bihar, West Bengal and Orrisa. Of the two types of mango malformation, vegetative malformation is more common in nursery seedlings and young plants. Floral malformation affects trees at the bearing stage. In vegetative malformation or bunchy top, compact leaves are formed in a bunch at the apex of shoot or in the leaf axil and growth of shootlet is arrested. Floral malformation directly affects the productivity. The incidence of disorder varies from variety to variety. Deblossoming alone or coupled with a spray of 200 ppm NAA lowers the number of malformed panicles significantly. This disorder is mainly noticed in Punjab, Uttar Pradesh, Bihar and West Bengal. The distal –end of the affected fruits turns black and become hard. These fruits ripen prematurely and become unmarketable. This disorder is caused by the smoke of brick- kilns located within a distance of 600m. Gases like carbon monoxide and carbondioxide, sulphate dioxide and acetylene cause these symptoms. It can be controlled by raising the height of the chimney of the brick kilns. Spraying borax (0.6 %) at 10-14 days intervals starting from fruit set also controls it. This malady is characterized by a cluster of fruit lets at the tip of the panicle giving an appearance of bunch tip called jhumka. These fruit lets are dark green with a deeper curve in the sinus beak region compared with normally developing fruit lets. These fruit lets grow to marble size after which their growth ceases. One of the main reasons for clustering is the adverse climate during February –March, particularly the low temperature. Most of the fruits are aborted with shriveled embryos and do not develop further, signifying the role of normal embryo growth in the development of fruits. It is in Alphonso mango. Fruits look normal from outside. But inside, a patch of flesh becomes spongy, yellowish and sour. This disorder has brought down the export of this variety. Inactivation of ripening enzyme due to high temperature, convective heat and postharvest exposure to sunlight are the causes. Use of sod culture and mulching are useful in reducing its incidence. Mango hybrids Ratna and Arka Puneet which have Alphonso like characters to not suffer from this malady. Harvesting mangoes when they are three-fourth matured rather than fully matured ones also reduces this malady.